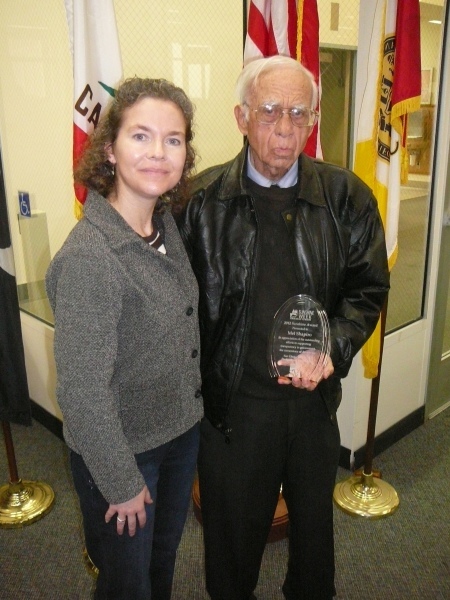 Mel Shapiro is his own man.The 84-year-old citizen activist had gotten the word that SPJ wanted to honor him for his exceptional and longtime efforts on behalf of transparency in government. As this years recipient of the San Diego Society of Professional Journalists Sunshine Award we wondered if he had a preference for a location for the presentation. One suggestion was the location where the previous award recipients had been honored- the Joan Kroc Peace Center on the USD campus. Or maybe a favorite restaurant? Thanks but no thanks, said Shapiro. His choice was the San Diego City Clerk’s Office in the middle of the week. At first, it seemed odd, but when you consider all the time he spends there and around City Hall, it was the most appropriate of places to honor a man who has relentlessly pursued open government issues as much as anyone in the history of San Diego. When the time came for the ceremony the women who worked in the clerk’s office were lined up along the long counter that runs across the center of the office. I am not sure if they were members of Mel’s fan club but they all apparently knew and liked “Mr Shapiro.” They were joined by their boss, the Clerk of the City of San Diego, Elizabeth Maland. They listened intently to the proclamation, which described how Shapiro was a civic activist and watchdog possessed of much passion and purpose. When done, the group applauded and were all nodding their heads in agreement. Maland needed no encouragement to talk about Mel and his efforts. “He is always the one to point us in the right direction,” she said. She recalled how Shapiro “pointed out” her office was behind in updating a litigation log to track lawsuits involving the city. It was a small thing but typical of his efforts to make government play by the rules, whether through gentle prodding or suing the rascals. The consensus by all in attendance on that Wednesday afternoon was Mel Shapiro was most worthy of the 2012 Sunshine Award from the San Diego Society of Professional Journalists.